OET scientists, Dr Mine Aksular and Dr Leo Graves, recently travelled to Mexico City to spend six days visiting the Centre for Molecular and Cell-Based Therapeutics (CMCBT) as part of an international research collaboration (TRANSDIA) investigating a novel therapy for type I diabetes. Accompanied by collaborator Dr Stephen Hughes from the Nuffield Department of Surgical Sciences, Oxford University, the team were able to provide expert advice and practical guidance on key aspects of the project, helping to facilitate the transfer of technology to Mexican researchers. The TRANSDIA project has been established to develop a pancreatic islet isolation and transplant program in Mexico to help those with diabetes type I, which has been identified as one of the major health priority areas in Mexico. Funded in the UK by the Newton Fund through Innovate UK, and in Mexico through CONACyT, OET will be drawing upon its specialist knowledge of the baculovirus expression system to help design a novel pre-transplant gene therapy approach for application on harvested islet cells in order to maintain their viability during transplantation. Left: Dr Mine Aksular, Fernanda Murgui-Meca and Dr Stephen Hughes standing outside the front of the newly built CMCBT facilities. Right: Dr Leo Graves and Dr Mine Aksular dressed for working in the clean room. Both Mine and Leo were able to work with CMCBT scientists to demonstrate the necessary cell culture and cellular transduction techniques using specially constructed baculovirus vectors (so called BacMAMs). The transduction technique allows for the introduction of foreign genes to mammalian cell lines including human cells and enabling expression of the therapeutic gene by incorporating a specific mammalian promoter. Prior to the visit, OET researchers analysed suitable gene inserts to help protect islet cells from apoptotic factors generated as a result of cell stress. In addition to this, they were able to increase the efficacy of the BacMAM virus by incorporating modifications to the vector backbone. Dr Leo Graves with Brenda Ojeda and Alfonse Narvarez performing cell culture techniques. With a dedicated team of researchers, state of the art clean room facilities and access to additional laboratory services at the National Autonomous University Mexico provided through the support of funding body CONACyT, the CMCBT is the principle research facility for the TRANSDIA project in Mexico. A final project meeting between all parties will take place in October later this year and it is hoped that following this, the technology behind TRANSDIA will be successfully transferred to Mexican researchers allowing Mexico to establish an islet transplantation programme and, in the longer term, to pioneer the use of pre-transplant gene therapy to improve transplant outcomes. 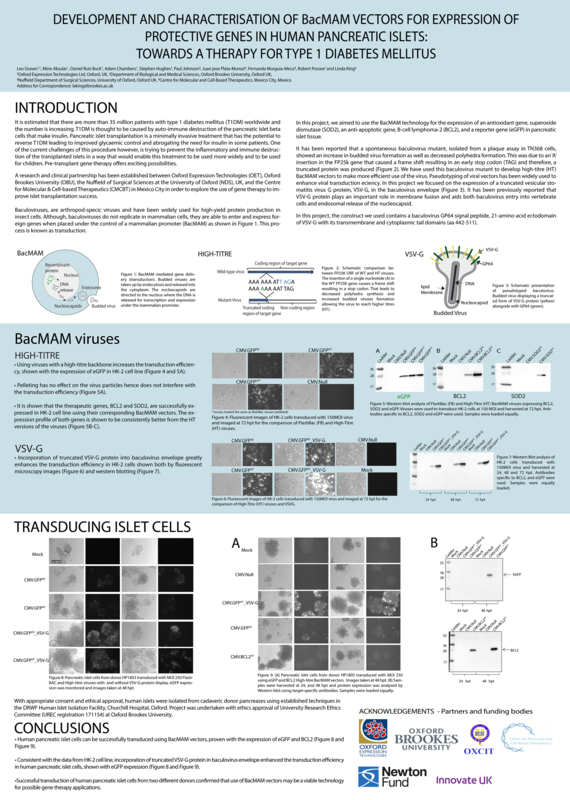 To find out more about this work, click here to view the poster exhibited at this year’s ISBiotech Meeting in the USA – ‘Development and characterisation of BacMAM vectors for expression of protective genes in human pancreatic islets; towards a therapy for type 1 diabetes mellitus’ or here to visit the TRANSDIA project website. How healthy are your cells? Adapting Insect Cells to a New Growth Medium?